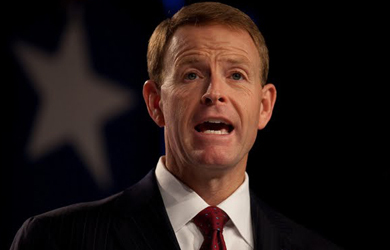 Tony Perkins of the Family Research Council has been ratcheting up his anti-gay rhetoric recently, and finding new ways to blame gays and lesbians for what he sees as society’s problems. Last month, for instance, the Air Force suspended a class on “Nuclear Ethics and Nuclear Warfare training,” after it was revealed that the class relied heavily on Christian teachings. The Military Religious Freedom Foundation objected to the class and solicited complaints from Air Force officers, who the group says were mostly “practicing Protestants and Roman Catholics.” While the controversy centered on allegations that the class represented an unconstitutional religious test and endorsement of one particular religious viewpoint, Perkins claims (without any evidence) that the class’s suspension was actually the fault of gays and lesbians and the repeal of Don’t Ask Don’t Tell. It looks like the repeal of “Don’t Ask, Don’t Tell” is off to a flying start–at least in the U.S. Air Force. Hello, I’m Tony Perkins of the Family Research Council in Washington, D.C. Starting this week, the Pentagon’s changing some of its policies to make the military more welcoming for homosexuals. In the Air Force, that means dropping the religion from its training course. After 20 years, officials scrapped the Bible verses that had been a part of the “Just War” curriculum since early 90s. Apparently, someone complained that the material was “promoting… right-wing fundamentalist Christianity.” The class was suspended the very same day. No questions asked. See, that’s what happens when homosexuality clashes with faith. Faith loses. This isn’t about political correctness, David French said. “It’s about cleansing [God] from the public square and building a completely secular society.” Unfortunately for our troops, this is just part of the President’s plan to radicalize the military. And if the Air Force is any indication, tradition won’t be the only thing taking a nose-dive. This month, TV’s biggest networks aren’t telling the story–they are the story. Hello, I’m Tony Perkins of the Family Research Council in Washington, D.C. Where’s the “family” in ABC Family? Parents are wondering after the latest report from GLAAD, the Gay and Lesbian Alliance Against Defamation. Every year, GLAAD rates channels on how well they push the homosexual agenda through characters and storylines. This time, ABC Family got top honors–making them only the second network ever to get an “excellent” rating. Michael Riley, ABC’s chief executive, said he was “proud” to be honored. Celebrating homosexuality, he said, is “very important to us.” That’s a serious problem, considering that ABC Family is the highest-rated network for 12 to 34-year-olds. Most parents trust the channel, which used to be owned by Disney. But it’s a different story now that the network’s going out of its way to indoctrinate kids. That won’t change until you get involved. Contact ABC. Tell them what they gain by being gay-friendly doesn’t compare with what they’ll lose. And that’s viewers.